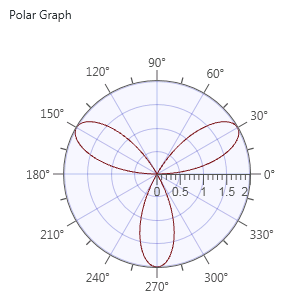 Plot radial, point, or complex data on a 2D polar graph. You can plot arrays of radial, point, or complex data on a 2D polar graph. For radial data, each real value corresponds to the radial distance of the point from the origin and its index value represents the angle of the point in degrees. For point data, the polar coordinates are given as an array of clusters (r, theta), where r represents the distance of the point from the origin and theta represents the angle in degrees. For complex data, the points are plotted at x and y locations corresponding to each complex element, where x is the real part and y is the imaginary part. 1D array of radial, cluster, or complex values The array is a single plot, where each radial, cluster, or complex value is a point.